The photo was released yesterday, the first day of 'Black History Month'. Virginia Gov. Ralph Northam appears all but certain to resign after losing support from every Democratic state lawmaker and other close allies. Virginia's Legislative Black Caucus, the state House Democratic Caucus and the state Senate Democratic caucus all called on Northam to resign late Friday after acknowledging he appeared in a photo from his 1984 medical school yearbook in a racist costume. Several other influential advocacy groups with strong ties to the Democratic governor, including the League of Conservation Voters and NARAL Pro-Choice Virginia, also called on Northam to resign late Friday. The governor had previously resisted calls for his resignation after the photo went public Friday afternoon. But he now faces an almost untenable situation without the support of any Democratic lawmakers or other allies. Planned Parenthood is calling on Virginia Gov. Ralph Northam to resign after he acknowledged appearing in a photo wearing a racist costume. The abortion-rights group joins a growing list of Democrats and progressive advocacy groups calling for the Democratic governor to step aside. Northam has apologized for appearing in a photo in which one person is dressed in blackface and another is wearing a full Ku Klux Klan uniform, but he is resisting calls to resign. The photo appeared in his 1984 medical school yearbook. Pro-choice groups such as Planned Parenthood have been key supporters of Northam during his political career. Northam has recently come under fire from Republicans for supporting looser restrictions on late-term abortions. He changed his mind and says he doesn't remember this ever happening. Or he doesn't think so. What's this guy been like as governor, I have no idea. After a years-long battle on Medicaid expansion for poor Virginians, and just a few weeks into his term, he signed into law expansion of Medicaid for those who really need it. I know people who have greatly benefited. I’m of the frame of mind that most politicians who reach that level have cards ready to be used against them and televised, highly publicized comments this week on late-term abortion could be why his card came up so suddenly and was made public. Northam now says that it's not him in the photo. His admission yesterday, followed by his back-pedaling today, show how his & his PR’s handling of the yearbook photo has failed miserably. Northam appears at the 33 min. mark. From yesterday's WaPo, an 'anonymous concerned citizen's' tip to a reporter from Big League Politics . The reporter who exposed Virginia Gov. 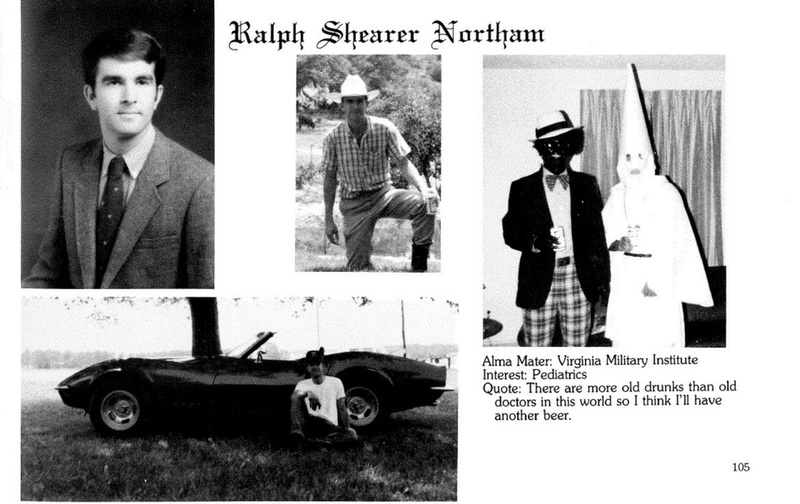 Ralph Northam’s racist yearbook photo said a “concerned citizen” led him to the story that has prompted widespread outrage and calls for the Democrat’s resignation. “It’s clearly a picture of him,” he said, but again could offer nothing more in support. He added, “The photo is genuine. It shows clearly he’s a racist. RICHMOND, Va. – Virginia’s Lt. Governor Justin Fairfax responded on Twitter to a report that hinted at sexual assault allegations that were brought against him over the last year. The release by Fairfax comes as the Lt. Governor waits to see if he will become Virginia’s second African-American Governor after racist photos in Gov. Ralph Northam’s EVMS yearbook appeared in media circulation on Friday. “Lt. Governor Fairfax has an outstanding and well-earned reputation for treating people with dignity and respect. He has never assaulted anyone — ever– in any way, shape, or form,” added the statement. The statement also expressed that the Washington Post had examined the allegations against Fairfax and considered not to publish them. The report on Fairfax was first published by the conservative-leaning online publication Big League Politics, which sourced a Facebook post of a Standford University fellow. The account hints at misconduct by Fairfax at the 2004 Democratic National Convention when he was a staffer for then-presidential candidate John Kerry. WaPo has revisited the allegations and included the following today's article online, front page.. This clip of Northam refusing (or ignoring) to shake the hand of EW Jackson, an opponent in 2013 election for Lt. Governor, is widely publicized as proof of his racism, but is it that, a personal grudge, or is he really preoccupied/spaced out? RICHMOND — Virginia Attorney General Mark R. Herring (D) said Wednesday he dressed in blackface during college, elevating the Capitol’s scandals to a new level that engulfed the entire executive branch of government. Herring called it a “onetime occurrence” for which he accepted responsibility. In his statement, Herring suggested that he knew the photo would someday surface. “I have a glaring example from my past that I have thought about with deep regret in the many years since, and certainly each time I took a step forward in public service, realizing that my goals and this memory could someday collide and cause pain for people I care about, those who stood with me in the many years since, or those who I hoped to serve while in office,” said Herring, who announced in December that he planned to run for governor in 2021. A lot of white politicians must be quaking in their boots.